Observing your garden in the dormant period makes for a sound idea. Only then, when you’re not distracted by the abundance of summer vegetation and blooms, can you clearly see the backbone of your plot. Permanent strong lines and curves lead the eye, create optical illusions and frameworks, and add extra depth and dimension to your garden. An excellent example of how best to create winter structure can be seen at Ousden House, which nestles in the outskirts of Newmarket, Suffolk. There, owners Alistair and Lavinia have spent nearly twenty years perfecting the flow, accents and shaping of their rural plot. Ousden House lies in the grounds of Ousden Hall, which was demolished in 1954. The only remnant of the Hall is a lofty red brick clock tower, and this sets the scale and sculpting for subsequent garden structures. Taking inspiration from and echoing the surrounding buildings and landscape is a definite way to lock in the identity of your garden. 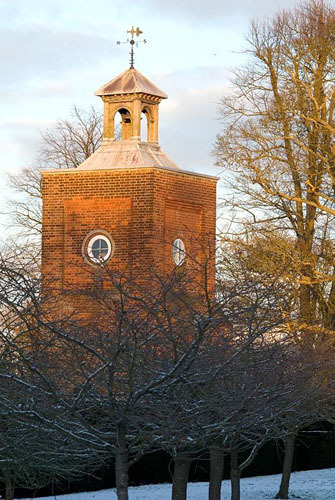 At Ousden House, hedging, gateways and gazebos all mirror the clock tower. Looking out from the house, you’ll see a thick rectangular yew hedge. Cleverly scaled to be slightly larger than the dwelling itself, it frames the building beautifully when viewed from the lawn beyond. Formed of high perimeters yet scalloped lower to the front and back, a visitor inside the house can only see tantalising glimpses of the planting that lies within, and is duly enticed outside. A short walk reveals beds packed with English roses. 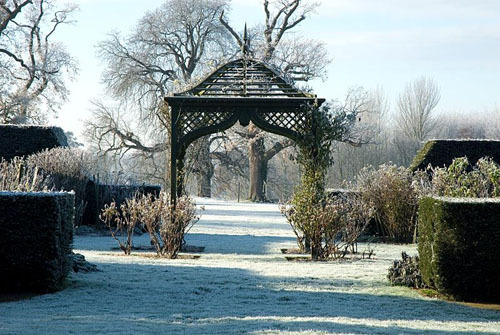 The central focus of this rose garden – a latticework wooden gazebo – is positioned to perfection. It frames a pair of distant oak trees like a picture. Ousden defies the convention that hedges must be straight. 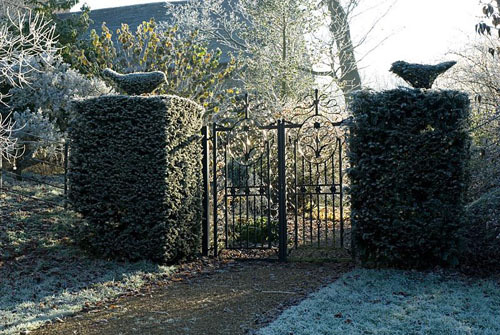 A pair of serpentine yew hedges snake their way down to a rural landscape framed by simple metal gates. This way such bold, dramatic lines don’t fight with the adjoining view in the slightest. This is simple, effective, confident structuring. 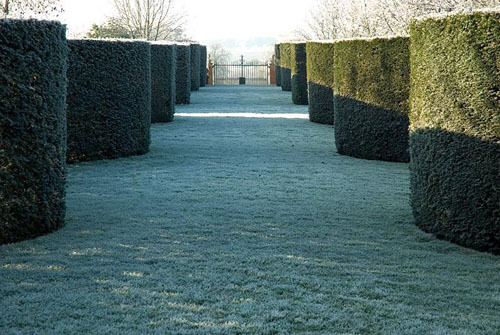 The yew hedges, whether straight or weaving, are a repeated theme throughout the grounds. This unites all areas, yet allows for individual ‘rooms’ to evolve. In one area, low-lying gravel gardens appear, accentuated only by spiral topiary. Specimen trees of malus are planted in others, their bright red crabs glistening in the low-level winter sunlight. Topiary balls and birds add humour and character. Specimen trees, surrounded by low-lying evergreen hedging, create clean crisp lines in winter, yet in summer, there is an opportunity to fill the beds within with annuals, bulbs and perennials. The punctuation of the yew lessens as you move away from the house, giving way to more informal gardens that link to the surrounding landscape. Fewer peripheral manmade structures, whether brickwork, timber or clipped hedging, allow gardens to sit well in their environment. 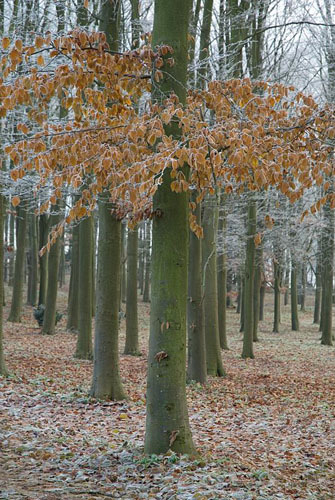 At Ousden House, a beech plantation, set out by previous landowners in regimental rows, is being selectively thinned to create more naturalistic spacings. Water is also being used to define the area, in the form of a moat and lake. Both have required serious dredging over the years, but now offer a clear reflection of the trees and accompanying woodland plantings. In one area close to the lake, the lower canopies of the surrounding beech trees have been lifted to develop a clearing. Here, two horses – a mare and her foal – made entirely from scrap metal by artist Harriet Mead, gaze towards the water’s edge. The subject matter of this bold yet peaceful sculpture sits perfectly in this rural setting. This entry was posted in Seasonal, Style notebook, Winter on January 23, 2015 by gapadmin.